As the legend goes, when Cortez conquered the Aztecs and asked their emperor Moctezuma for their most prized commodity, he was shown the vaults of cacao instead of gold. The real gold of the Mayans, Oro Maya Chocolate, comes from the lush tropics of Mesoamerica where it first evolved in the Amazon River Basin between three and six million years ago. The Mayan civilization is credited with being first to document the manufacturing of chocolate and popularize in their culture, as they considered it sacred and believed it contained the ‘spirit of the gods.’ The cacao is grown, harvested and produced in the same Honduran jungle sacred to the Mayans. 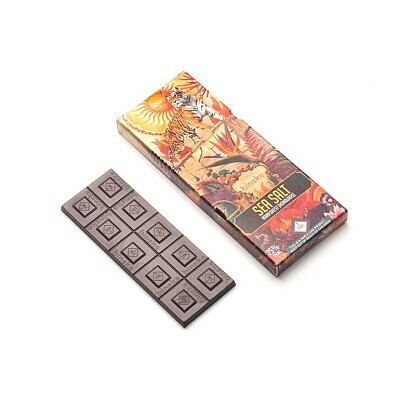 Distillate infused chocolate bar made from pure 75% Oro Maya!